Subtitled "Top Secret Places Governments Don't Want You to Know About"
This book felt a bit nostalgic for me - it reminded me of the heyday of the British UFO Magazine, for which Nick Redfern frequently contributed. Many of the accounts of secret bases sounded like the kind of ground they used to cover, and I enjoyed the overviews and updates offered by Redfern immensely. I know Nick is known well for his cryptozoological research, but I think he is at his best when discussing UFO secrecy and related topics. He provides context, even-handedness and good judgement. Even when tackling the most infamous of cases, he wields his dissecting scalpel with a calm professionalism too often lacking elsewhere. 'Keep Out' provides us with a parade of secret establishments, many of them well known to the initiated. This global exposé quickly takes us into the heart of Area 51, the Dugway Proving Ground, Wright Patterson AFB and, in the UK, RAF Bentwaters and the inconspicuous but infamous Rudloe Manor. Topics range from crashed flying saucers, to emergency government bunkers, to biological and chemical warfare research. None of this, I would imagine, breaches National Security - not least because many of the conspiracy theories surrounding these establishments appear to be cover for more prosaic, but nevertheless well-dodgy government activity. Where this kind of research has really got governments rattled (particularly the U.S. Govt) is where there has been successful hacking of their allegedly secure websites. Is that because 'the Truth' has been revealed through these actions, or is the US Government's over-reaction to such infiltration by benign, possibly misguided figures simply a cack-handed approach by an organisation whose pride has been stung? Redfern makes no judgements, but I'm sure his sympathies lie with the forlorn UK hackers facing extradition. One area that is particularly sensitive, it seems, is the whereabouts of the Vice President's emergency bunker, especially when true power lay with that office not so long ago. That line of enquiry brings Redfern to a wider debate - the question of whether governments are preparing for an event at the end of 2012. Redfern asks, quite properly, whether governments really do take these things seriously, and prepare for the worst case scenario. Have 'End Times' beliefs infected the collective minds of world governments? Certainly there is some strong evidence for preparations on a vast scale - the Svalbard seed bank is a good example oft his kind of emergency provision, perhaps emerging from a deeper fear of humanity's collective war upon its own environment. Creation of underground 'Arks' seems a realistic preparation in this precarious world. Perhaps less realistic are possible operational Moonbases. We enter the world of Sci-Fi, many would assume, yet Redfern provides us with food for thought even in this far-flung sphere. He cites an old gem of a book by George Leonard regarding numerous anomalies on the surface of the Moon, as well as the odd case of psychic spy Ingo Swann. Scientific data, particularly of the visual variety, is filtered by government funded organisations before getting into the hands of standard scientists, and the Clementine imaging of the Moon's surface in more recent times was overseen by the DoD. So, perhaps this is not a case that should be dismissed out of hand. Is something going on up there, perhaps by agencies unknown? The abundant sources of water ice on the Moon, admitted to by reticent space agencies of late, indicates that such a possibility is not entirely impossible to imagine. And remote viewers have proven their mettle within Intelligence circles, so perhaps Ingo Swann really did 'see' something up there? 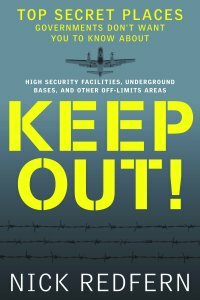 As if these cases were not enough, 'Keep Out' takes a long hard look at Montauk, the Philadelphia Experiment, HAARP, alien bases in and around Puerto Rico and, perhaps closest to home for us Brits, the weird secrets of the darker corners of the rambling London Underground complex. Overall, the book presents us with a rich tapestry of weird goings-on beneath our feet, in secret government installations and even on our Moon. Make of it what you will, but the journey through this dark labyrinth is absolutely fascinating.